Most kids love smoothies! They’re sweet, creamy, and a great way to sneak in some healthy foods for kiddos who might not always eat enough fruits and veggies at meals. This smoothie is SO good and super easy to make! 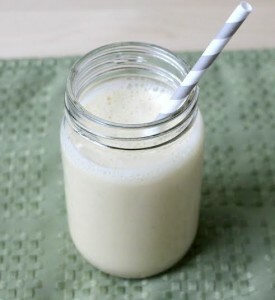 It uses canned peaches packed in 100% juice, banana, and yogurt for healthy digestion, calcium, and protein. This is the perfect option for a quick breakfast, after school snack, or even healthy dessert! Place all ingredients in blender, and blend for about 1 minute or until completely smooth and creamy. Enjoy!